 Whether you want to push your limits or take in the sights, it's a must do ride! After flying in from Seattle at an unspeakably early hour and rendezvousing with ADV Pulse Senior Editor Rob Dabney, we fled from LA like we were running from the law, lane splitting past Sunset Boulevard over the Grape Vine into the San Joaquin Valley, fighting high winds and triple digit temperatures the whole way. Just as I was beginning to wonder whose idea it was to ride all the way out to this event, we reached the Sierra foothills and my dissent evaporated. Desert floor gave way to curvy climbs and long sweeping turns. 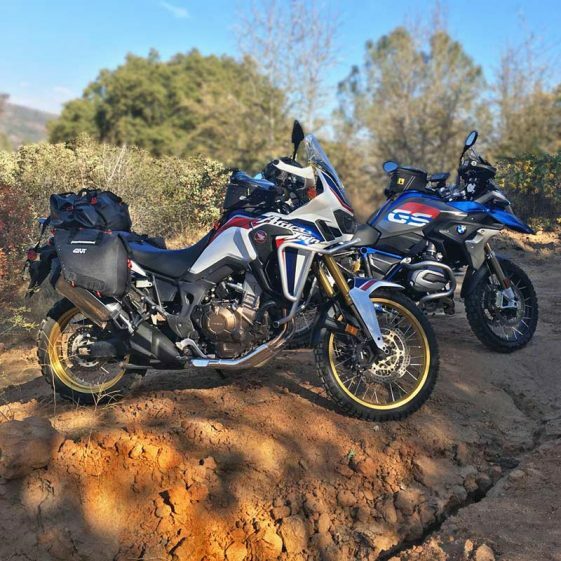 The Honda Africa Twin and BMW R1200GS Rallye we were riding transitioned from racking up mind-numbing highway miles to scraping pegs with ease. The twenty-five-mile ascent from Prather up to Shaver Lake could be some of the best pavement I’ve ever experienced on two wheels. The closer we got to our final destination of Huntington Lake, it became more and more clear why this has been the home of the Adventure Rally Sierra Edition since its inception in 2013. This event is designed to get people to experience riding in a new location with little or no preparation. The format is essentially a two-day scavenger hunt with a home base of China Peak Mountain Resort located in the heart of the Sierra. Imagine showing up to a region that you’ve never ridden before and being handed a map marked up by the most knowledgeable locals, with all the best routes and points of interest. Price of admission includes six meals; a loaded goody bag and more amazing riding than you could shake a stick at. 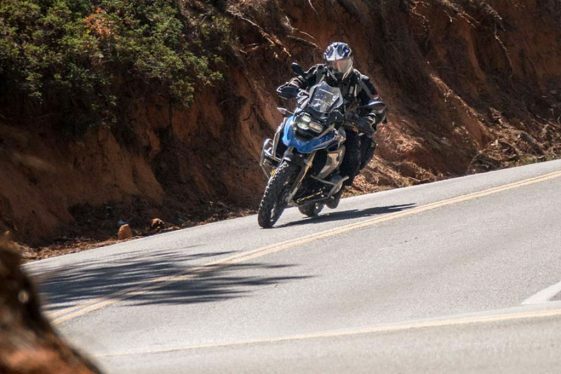 Pushing the big BMW R1200GS Rallye on a loose hill climb. Each team of two to six people was given a map, score sheet, time card and guidebook just 30 minutes before being let loose in the Sierras Friday morning. The Rever app was employed to prove that groups had actually gone to where they claimed (along with Instagram posts) but navigation occurred primarily without GPS. Once you reached a point of interest on the map, you marked it on your scorecard, took a picture with all the riders in your group (or all of the bikes) and then posted said picture to Instagram using pre-determined hash tags. The more places you visited the more points you got, with higher points awarded for harder-to-reach waypoints. Although it might seem complicated, it was actually quite an ingenious way to document and score the event. The Adventure Rally is designed to get you out on the trail to see as many incredible vistas and unique destinations in California’s Sierra Nevada Mountains as possible. Friday was one of the most memorable days of riding I’ve ever had. It’s the only time I’ve ever been on an adventure ride that nearly degraded into a survival situation. Our group rode out of China peak at 8:30am brimming with excitement and didn’t return until 10:30pm that night: exhausted, dehydrated and cold as hell. Not due to lack of preparation but simply because we ended up on one of the gnarliest trails any of us had ever encountered on big bikes. It was getting late in the afternoon and after completing several trails rated “black diamond” earlier in the day with no trouble, we figured this one would be no different. With a description in the book of “Masochists will love it” and what looked like only a short distance on the map, we couldn’t resist. The first rocky descent had us all thinking “I hope we don’t have to ride back up that” and the trail just continued to get more brutal with one loose, rocky hill climb after another. 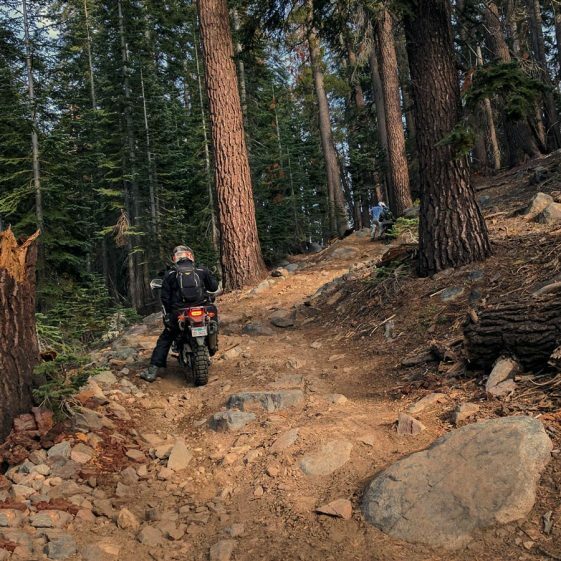 Every now and then we’d get a few hundred yards of smooth riding that would tempt us into thinking we were done with the hard part, but this only lured us into more torturous terrain. 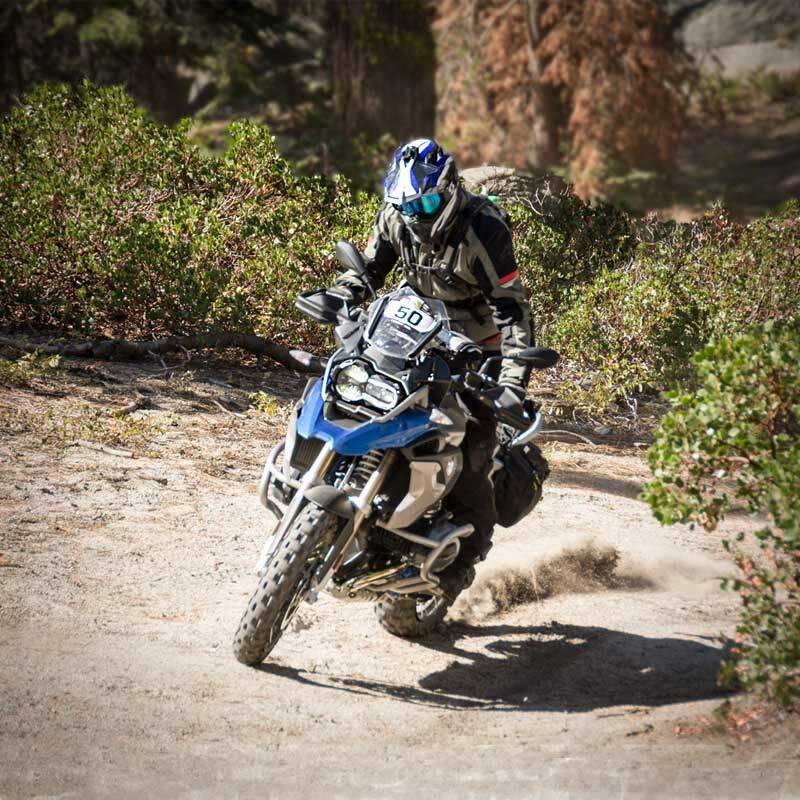 Eventually, we caught up with another team of riders from the rally that had made the same fateful decision. 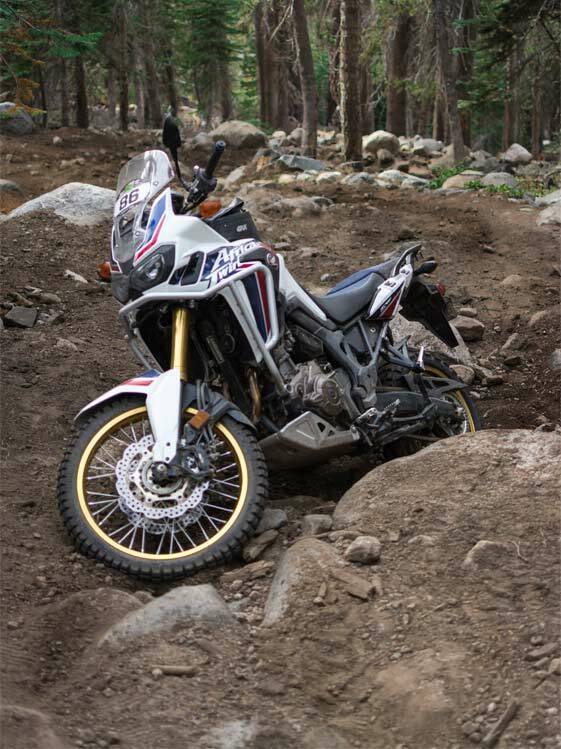 One of the riders was too exhausted to ride anymore and another had smoked the clutch on his KTM 950 Adventure. At this point we were all struggling to get our big bikes through the rough sections, so we joined forces and worked together as a team (leaving the 950 on the side of the trail) pushing on. We were sure salvation was just around the next bend, but as the Sun began to set, we ran into a group of locals in heavily modified jeeps that gave us the bad news that we had more difficult riding ahead of us than behind us. Continuing on would guarantee us a night in the forest with no food, water or shelter, soaking wet with sweat in freezing temperatures. Reluctantly, we made the decision to turn tail and head back the way we came in. To no one’s surprise, what was difficult in daylight was nearly impossible in darkness. 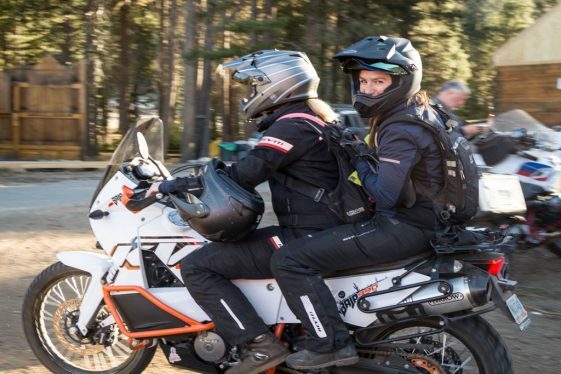 Steam emanated from our helmets and sweat dripped off our chins while we repeatedly dropped and picked up 500-pound bikes at over 9,000 feet elevation. Having run out of water long ago, at one point we were literally taking turns face down in a creek sucking water through a Life Straw. We hiked steep grades, rode at the upper-most limits of our skill (what we had left) and dug deep to find the will to keep pushing forward. This was the kind of exertion that reeks of desperation and we still had miles to go. One of the riders in the group we had merged with was in bad shape and was struggling just to walk the trail. There was no cell reception in this remote part of the forest, but one of our team members had a Garmin InReach with two-way text messaging that allowed us to alert event organizers to our situation. Working together to get all the bikes up the last gnarly hill climb, we finally got everyone out. Event coordinators were there to meet us at the trailhead with hot food and water and were in sheer amazement that we even attempted the trail on our big bikes. 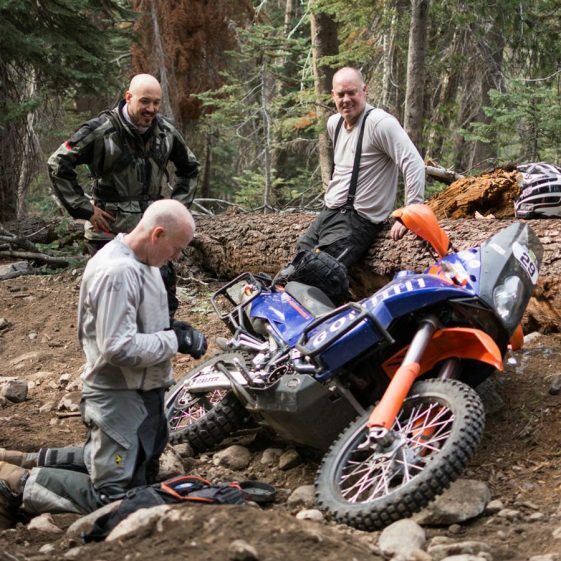 They told us the waypoint we were trying to reach was intended to be accessed from the south and that normally when riders try to reach it from the north, they immediately turn around after encountering the first rough section. We discovered later that this particular trail was actually an infamous rock crawling gauntlet similar to the Rubicon Trail. 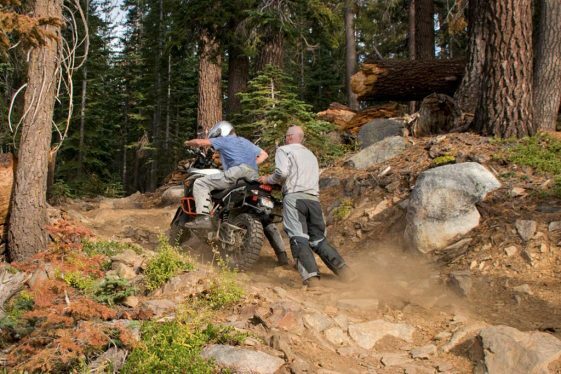 While it’s just 16 miles long from start to finish, the Swamp Lake trail is usually done over a two-day span in well-equipped, high-clearance vehicles with expert operators. 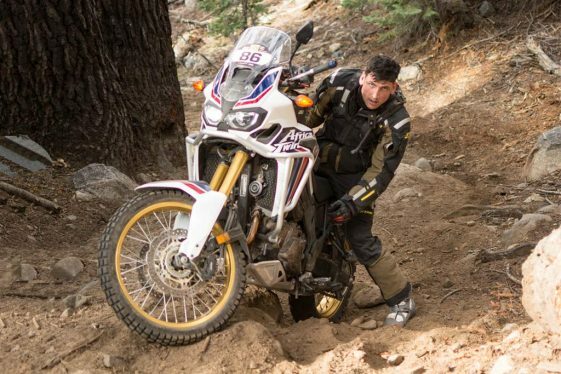 It it doable on 500-pound adventure motorcycles? Yes but not advisable, especially with a late afternoon start. We tried almost every trick in the book to get this KTM 950’s clutch working again. Unfortunately, it had to be left on the side of the trail overnight to be retrieved the next day. Luckily, there were no major injuries and our motorcycles were still able to get us back to camp under their own power. Soaked in sweat and shivering cold with an ambient air temperature of around 35 degrees, we finally headed back. I watched animal eyes flash and disappear in the dark abyss on the side of the road and all I could think about was what we would get to experience tomorrow. Sleep came easy after one of the most thrilling, humbling and adventurous days I’ve seen. Saturday morning was greeted with aching bodies and sleepy eyes. No longer concerned with the competition aspect of the weekend, we opted to drink coffee while other attendees hurried out the door. Once adequately caffeinated and dosed with enough ibuprofen to function, we set about fixing our hobbled motorcycles. The master at work! Owen Balduf of RawHyde Adventures offered to help repair the Rallye. He has performed countless valve cover repairs on GSs over the years. Of the bikes in our group, the BMW R1200GS Rallye had a hairline crack in the valve cover along with a broken off shift lever. One of the Africa Twins had a right foot peg that was completely severed from the bike and the other had a cracked water pump housing as well as a skid plate that was dangling from its subframe. The RawHyde staff, managing the demo fleet for BMW, were kind enough to assist us with repairs on the GS while Team Red (Honda) helped us with the Africa Twins. In the interest of time, the guys at Honda let us to swap our press loaners for AT’s from their demo fleet, allowing us to continue without delay. 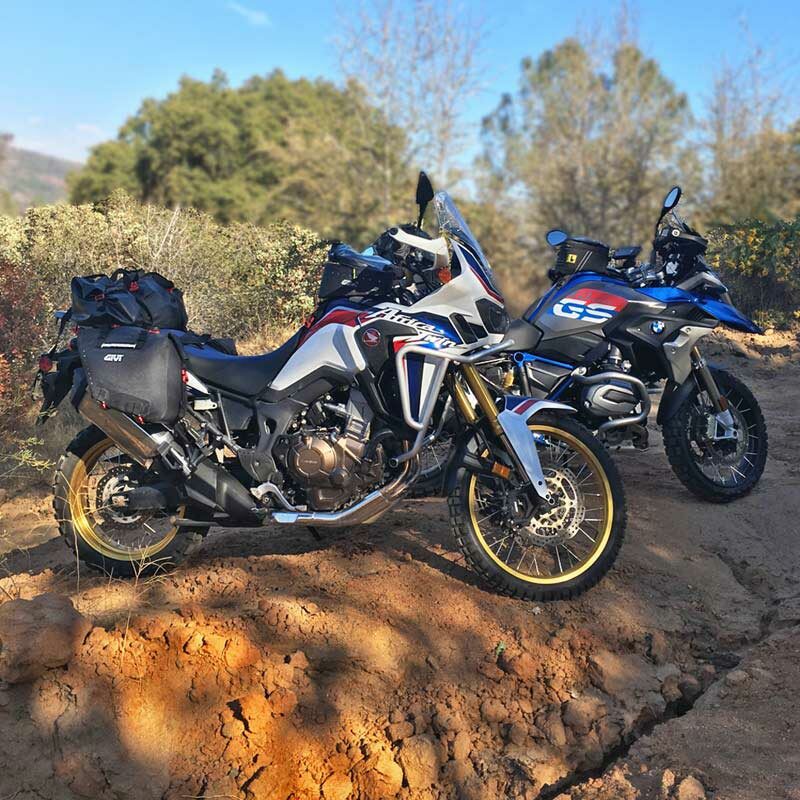 With a “good as new” GS and two fresh Africa Twins, the ADV Pulse team was back on the make but ready to take it a bit easier than the previous day. We ran into the REV’IT! Women’s Team on our way out and decided to join forces checking out part of the famous Dusy Ershim trail and several scenic points of interest. We got a chance to ride with the REV’IT! Women’s Team on day two. It was great to see how passionate these ladies are about adventure riding. Carving twisty asphalt deep into the Sierra Mountains, we eventually made it to Mono Hot Springs. We soaked our sore bones in the warm pools, lay in the Sun and marveled at the distant sequoias. Our ride Saturday was the polar opposite of the day before and a good example of how the Adventure Rally can be anything you want it to be. That night points were tallied and an award ceremony was held after dinner, along with boisterously swapped war stories and battle scars from the weekend. My biggest takeaway was the community atmosphere that the event organizers were able to cultivate. 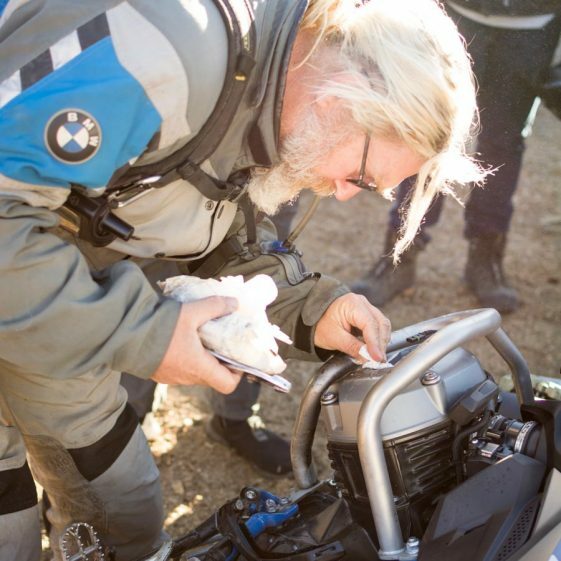 It was a refreshing take on the standard adventure motorcycle rally format. I had more fun, logged more miles and connected with more people than at any other event this year. 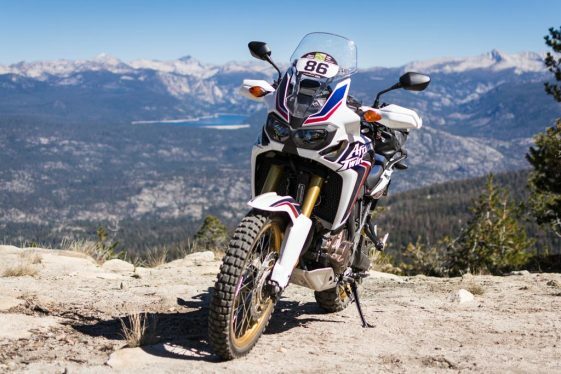 I was more than a little impressed with the Africa Twin after testing it in extreme conditions. 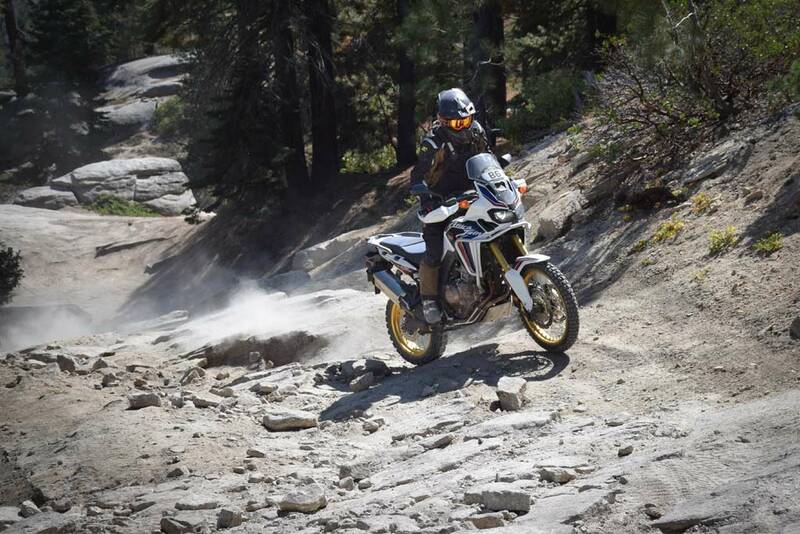 It felt much more nimble than its weight specs would suggest on the technical trails of the Sierras. Returning to the smog, heat and clogged highways of Los Angeles after the long weekend in the Sierra made me appreciate this event even more. It’s hard to imagine a starker contrast than the one between the rugged beauty of that mountain wilderness and the urban sprawl of LA. Not only is the remote location of the Adventure Rally Sierra Edition its defining characteristic but also its best kept secret. The Adventure Rally Series events are held annually in June and September with one in Colorado (Rockies Edition) and the other in California (Sierra Edition). If you haven’t been to one already, it’s an event you have got to experience for yourself. great read, i’ll definitely mark it on my calendar for next year! Very impressive guys! Well done! It’s funny how the best rides we remember are the hardest ones. Looks like this one will be deeply embedded in your memory. Very true! This one won’t be forgotten anytime soon. thinking about trails like that a lot. Don’t you think the AT DCT model, even though heavier, will help a lot? The other AT in our group had DCT and the rider said it performed very well in these circumstances. Great article! Thank you for sharing the ride. We have something in The Midwest called the Big Woods 200. Similar concept. This year there were 250 bikes, of which there were only 25 of us on big adventure bikes. I was thoroughly beat up after day 1. It’s a great format for an event if you ask me, tons of fun!